Updated: 5:25 p.m. | Posted: 3:40 p.m. If you find yourself in the back of a police squad car in Minneapolis, chances are you're black. If you're the one who dialed 911, it's far more likely you're white. 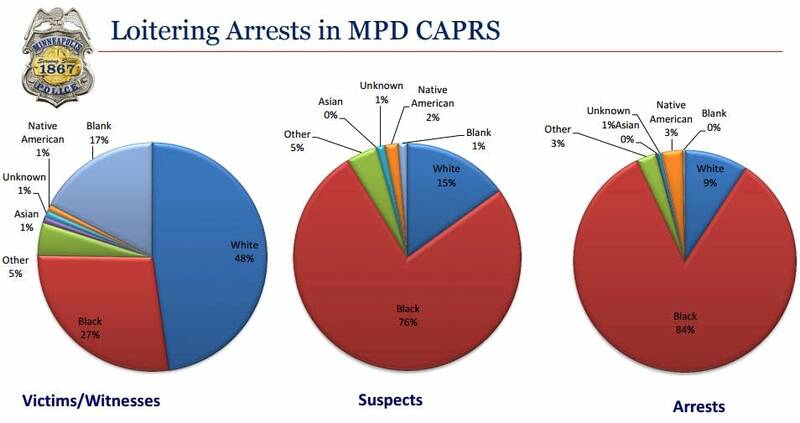 The Minneapolis Police Department released a report this week analyzing six years of crime data based on race. Chief Janeé Harteau requested the analysis after an ACLU study found black residents were seven to 16 times more likely than whites to be arrested for low-level crimes like marijuana possession, loitering and disorderly conduct. In a video published online in October, Harteau called the disparities "concerning," but said she needed more information on the subject. "I will ask the department's analysis unit to examine this in areas such as victimization, location of crime and reported suspect information," she said on the video. "These and other areas need to be examined before making an assessment on the effectiveness of improving public safety and public trust." This week's report confirmed the trends flagged by the ACLU and by a 2004 report from the Council on Crime and Justice: Black residents are arrested in much larger numbers than any other racial group. 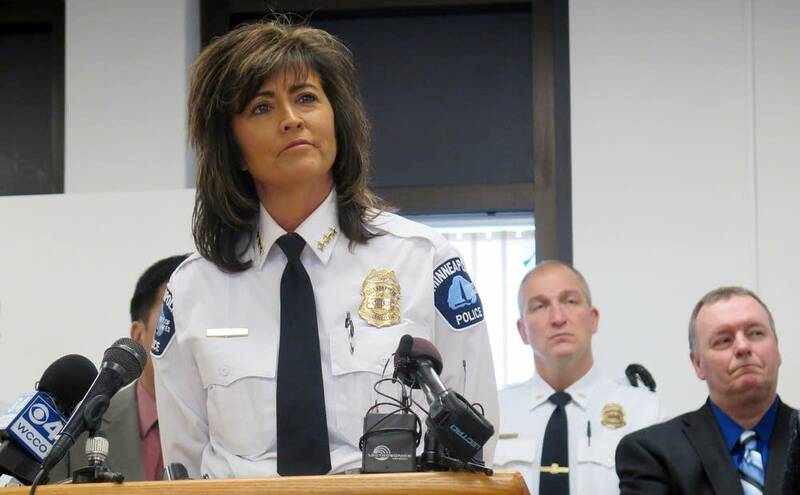 The Minneapolis Police Department released a statement saying the report showed that "we, as a community and as a city, need to address the issue of inequity and disparity." Nekima Levy-Pounds, a law professor and adviser to the organization Black Lives Matter, said the data suggest a pattern of discriminatory policing. She is one of 11 people being prosecuted for their roles in the Black Lives Matter protest at the Mall of America last December. "Officers have the power to choose whether they're going to release someone, whether they're going to issue a citation, or whether they're going to arrest someone," she said. "And the fact that so many people are being arrested for such petty offenses means that there could be an abuse or misuse of discretion by officers within the city of Minneapolis." But the report suggests it's not that police are simply choosing to arrest more black people. The people who called the police also played a role. ACLU Executive Director Chuck Samuelson agreed that the police aren't solely responsible for the disparities. "On the one hand, I think the police are doing exactly what the majority population wants them to do — the white population," he said. "They're behaving pretty much the way we want them to behave. They're targeting pretty much the people we want them to target. And they're enforcing the laws, pretty much, that we want enforced." When Samuelson says the police are following the orders of the white population, it's because that's often who's calling the police for these low-level crimes. For instance, while 84 percent of those arrested for loitering between 2009 and 2014 were black, African-American residents accounted for only 27 percent of people who called police to report such infractions. School Board Member Don Samuels, who lives in predominately black North Minneapolis, said many of his neighbors are reluctant to call the police. "People just feel alienated from the police, or don't trust the police, or don't think maybe that the kid is going to be treated fairly, or don't think that calling the police makes a difference, or don't feel empowered to engage the police," he said. African-Americans accounted for 46 percent of the city's victims of violent crime, and for almost 80 percent of the city's shooting victims. The city is trying to reduce its racial disparities in a variety of areas, including policing. The U.S. Department of Justice recently accepted its application to participate in a new program aimed at improving relations between police and the African-American community. More than 100 cities applied; Minneapolis was one of only six selected. MPR News' Brandt Williams contributed to this report.